The CoPulsation™ Milking System is an innovative pulsation system that consists of pulsators, controlling electronics for power the pulstors, shells, liners and splitter Tees. This product is easily installed and maintained and can replace any existing pulsation system. It is in use on farms ranging in size from small ones with bucket milkers to large parlors milking thousands of animals 24 hours a day. CoPulsation™ is the only humane way to milk an animal with a machine as it provides a gentle compressive massage action on the teat during the rest phase that is most similar to the sucking action of a newborn. Mastitis remains the most costly problem in the dairy industry in spite of decades of research and focus on management activities such as cleanliness and milking procedures. It must be recognized that the primary cause of mastitis is the milking machine as it is the item that is responsible for damaging the teat canals and creating the environment enabling the invasion of bacteria. The milking machine is responsible for the application of vacuum, extraction of milk and the required resting of the teat. There is an abundance of evidence supporting the fact that milking machine design, in particular pulsation, is responsible for mastitis. The manufacturers of conventional milking machines have provided detailed evidence of the numerous problems with their products in issued patent documents. A simple observation of dairy cows on any farm provides a basis of that evidence. First calf heifers first exposed to the milking process typically milk very quickly and completely. It is extremely rare to observe slow milking quarters or uneven udders within the first few months of a first calf heifer milking. The first indication of milking machines causing a problem is the nervousness of the heifers and the reddened condition of their teats after the machine is removed. A review of dairy cows that have been exposed to the milking process for at least several months shows the negative impact of the milking process. The emergence of slow milking quarters becomes evident. Many cows exhibit uneven udders (figure 1) upon machine removal which is the result of incomplete milkout and prior mastitis infections. A study by Randy Dingwell (Atlantic Veterinary College) has shown that 23.4% of teats are not sealed 6 weeks after dry-off. These teats are certainly not sealed between daily milking events leaving them exposed to environmental bacteria. A closer inspection of the milking process begins to reveal the true role of the milking machine in the destruction of the teat and subsequent mastitis infections. Studies documented in the Irish Veterinary Journal document the impact of milking machines on the health of teats. One study by Gleeson (IVJ 57(5), May 2004) documents the effect of milking machines on teat condition during the milking process. This study shows that all conventional milking machines cause measurable teat swelling (figure 2), both external and internal, during the milking process. Another study by Gleeson (IVJ 56(1), January 2003) documents the extent of that damage as described by the parameter teat sinus damage. These studies provide the factual evidence that milking machines inflict damage on the teats during the milking process that lead to physical degradation of the teat structure and canal. A recent study by Gehm (Evaluation of Milking Machine Design on Teat Swelling)further explores the research of Gleeson. This study evaluates teat condition of dairy cows in multiple herds milked with the CoPulsation™ Milking System. The results of this study show that all cows milked with the CoPulsation™ Milking System do not exhibit teat swelling (figure 3) during the milking process. The study documents the fact that the teats are actually smaller in diameter after the milking machine is removed. In contrast, the studies by Gleeson shows that cows milked with conventional systems consistently have teats that are larger in diameter after machine removal. The basis of the CoPulsation Milking System performance is the unique pulsation design. 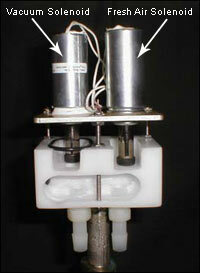 This pulsator has two dependent solenoids (figure 4) for controlling fresh air and vacuum supply to the shell. The one solenoid controls the fresh air admittance and the other the vacuum. The one solenoid must be closed prior to the other being opened. This design prevents the mixing of fresh air and vacuum as occurs with conventional pulsation. The design also enables the fresh air port to be substantially larger than other pulsators and allows the fresh air to enter the pulsator without squeezing around the solenoid plunger (figure 5). The net result is the ability to move air and vacuum in and out of the shell two to three times faster than conventional pulsators. The rapid movement of fresh air into the shell (figure 6) during the rest phase causes the liner to collapse differently than with conventional systems. The liner collapses in a manner that results in a compressive massaging action on the full length of the teat and the relief of the teat canal from the milking vacuum. A conventional pulsator is only capable of causing the liner to pinch the end of the teat and fails to relieve the milking vacuum. 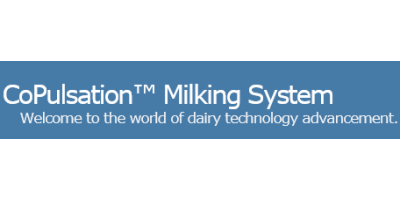 An integral part of the CoPulsation™ Milking System liner action is the design of the liner. The liner must be a round liner with a low collapse force. The round shape is critical as it provides the means of eliminating the milking vacuum from the teat canal opening during the rest phase. A low collapse force liner is necessary to achieve the compressive massaging action. A stiff liner will not collapse well thereby failing to massage the teat as required to relieve congestion and swelling. The evidence for this improved liner action is the fact that cows milked with the CoPulsation™ Milking System do not experience teat swelling during the milking process. The further evidence is the fact that cows milked with the CoPulsation™ Milking System experience substantially fewer mastitis infections. A study published in the Journal of Dairy Science (83:2004-2007) documents that fact that cows milked with a conventional milking system experience contagious mastitis infection rates that are 16 times higher than those milked with the CoPulsation™ Milking System. A subsequent study (International Dairy Topics) of longer duration further demonstrated a substantial reduction in environmental mastitis infections for cows milked with the CoPulsation™ Milking System. The CoPulsation™ Milking System pulsator design provides simultaneous pulsation action. The pulsator is operated at 45 ppm at a 60/40 ratio. This combination provides several fundamental advantages over conventional products. The simultaneous operation addresses the fact that dual pulsation action causes pressure pulses with the cluster leading to cross contamination. It also addresses the fact that dual pulsation causes pressure pulses within the shell as one pair of liners is opened while the other pair is already open. A study in the Polish Veterinary Journal (volume 8, issue 4, 2005, Pawlak) documents the fact that dual pulsation causes undesirable pressure pulses contributing to cross contamination. Pawlak notes that the pressure pulses drive milk back up against the teats making them wet. The teats of cows milked with the CoPulsation Milking System are left dry and not washed with milk by the milking machine. The true massaging action of the CoPulsation™ Milking System enables the product to operate at a lower pulsing rate. This provides sufficient time for the milk within the short milk tube to be evacuated. Observation of cows milked with the product show that the milk flow does fully cease during the rest phase. This can be noted visually by observing the cessation of milk flow into the cluster from the short milk tubes. The removal of milk from the short milk tubes combined with the true massaging rest phase and simultaneous pulsation virtually eliminates cross contamination as documented in published studies of the product. There exists a means of addressing the mastitis problem in dairy cows and the associated problems of slow milking quarters, uneven udders, incomplete milkouts and swollen teats. The solution is a pulsation design that provides simultaneous liner action that fully massages the teats eliminating the milking vacuum during the rest phase. This solution recognizes the fact that it is the combination of pulsation and liner action/design that milks the cows and is responsible for preventing mastitis. Any other options currently offered attempt to address the symptoms and fail to address the root cause of teat destruction. No reviews were found for CoPulsation - Milking System. Be the first to review!